There have been a lot of things to celebrate in April: Easter, Earth Day, the coming of spring. For us at the Tennessee Aquarium Conservation Institute and the Tennessee Aquarium, it was a month to celebrate milestones. The Tennessee Aquarium celebrated its 20th birthday and the opening of a new River Giants exhibit, and TNACI celebrated the continued success of the Lake Sturgeon Reintroduction program, one of our local river giants. 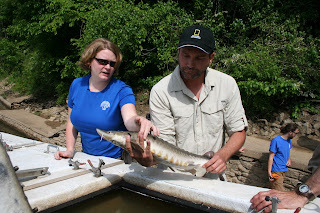 Each year we release juvenile sturgeon that are about six months old and six inches long. Occasionally we hold fish a few months longer so that they can be released at larger sizes, which is exactly what we did this year. Lake Sturgeon are very special fish that live in many rivers across the U.S. They are a river giant in their own right. The largest on record are 8 ft and 310 pounds, though now sizes of 5 ft and 100 pounds are more common. They can live up to 150 years and they do not reach sexual maturity until they are in their teens. While they are not listed as federally endangered, Lake Sturgeon are considered imperiled in Tennessee. In the 1960s, a combination of habitat degradation and overfishing caused the Lake Sturgeon to become extirpated from the Tennessee River. After some improvements in dam discharge practices as well as benefits from the Clean Water Act in 1972, a group of agencies decided to work together to bring the Lake Sturgeon back to the Tennessee River. The Tennessee River Lake Sturgeon Working Group partners include the Tennessee Aquarium Conservation Institute, Tennessee Wildlife Resources Agency, World Wildlife Fund, Tennessee Tech University, the University of Tennessee at Knoxville, U.S. Fish and Wildlife Service, Tennessee Valley Authority, United States Geological Survey, Wisconsin Department of Natural Resources, and Conservation Fisheries, Inc.
On April 27th, we drove up to Nashville to meet up with TWRA and a group of students from Mt. Juliet, Tennessee. We met them at Shelby Park near Shelby Bottoms Nature Center in downtown Nashville where the Cumberland River runs through the city. 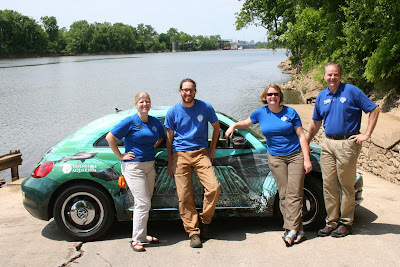 Dr. Zeb Hogan, the host of Monster Fish on the National Geographic channel was in town to help the Tennessee Aquarium open the new River Giants exhibit, so he decided to come along and help us with the release. TWRA brought thirty fish that were 2-3 years old and ranged in size from 24-30 inches. They are still very young, and will not be old enough to spawn for at least another ten years if not longer. These fish were born at Warm Springs Hatchery in Georgia and some of them lived with the TNACI for a few months before they were taken to TWRA’s hatchery. Each fish has a scute, the bony plate that runs along the side and back of a sturgeon, removed that designates how old it is. We do this so that when we catch the fish on monitoring trips, we can determine how old it is. 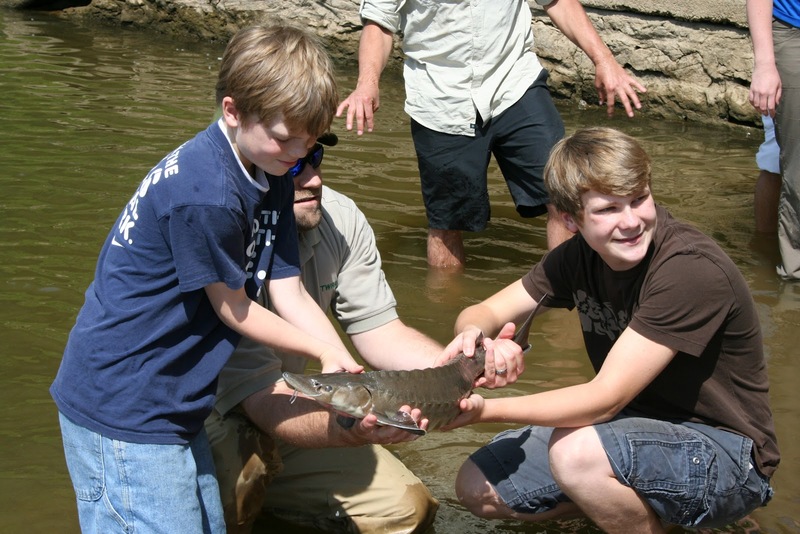 To date, 130,000 juvenile Lake Sturgeon have been released across Tennessee. Anna showing Zeb which scute has been removed on this fish. Fish were removed from Springfield Hatchery's truck and carried to the water by pairs of students. 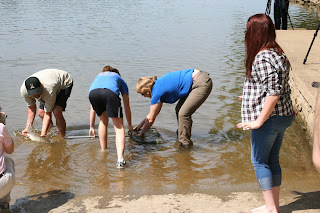 Anna helps a student remove the sturgeon from the net that carried it from the truck to the water. A fish swims from Zeb Hogan's hands into its new environment. We all had a great time! TNACI got to drive to Nashville in style in our River Giants Volkswagen Beetle. The kids had a good time too. Many took the opportunity to touch these majestic fish before letting them swim away into their new home. 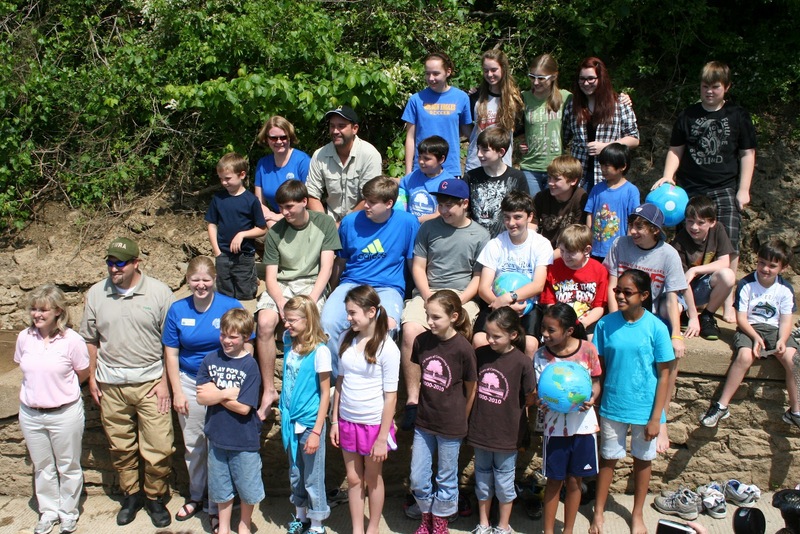 We hope that this experience will inspire these students to be conservationists. 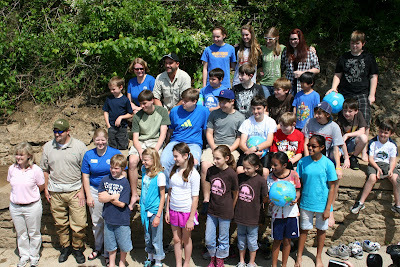 All of the students who helped us with the release. You don’t have to be a scientist to be a conservationist. Here are some easy conservation actions you can do at home. 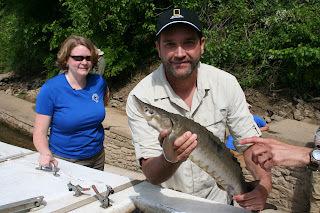 Start of Sturgeon Season 2012!